Okay, I want to get right to recognizing an amazingly strong young woman with our September Spotlight🌟! You may have recently caught the video I posted of her ridiculous 300 lb back squat! I’m talking about Vanessa Alvarado!!! I get so much excitement when I see her at the gym! She’s incredibly humble and coachable and so supportive of her peers! 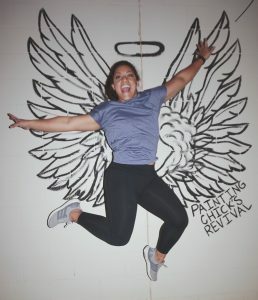 Please show some love for our Athlete Spotlight! Keep up the hard work, Vanessa!! How long have you been CrossFitting? 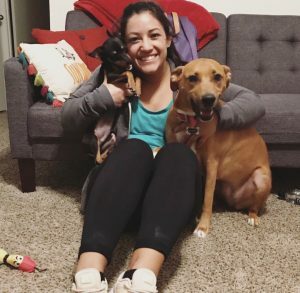 I joined crossfit a little over a year ago. Tell us about yourself… Where are you from? What’s your occupation? I am from Big Spring. I am currently going to school at ASU, duel majoring in Nursing and Spanish, and I am working at Shannon. 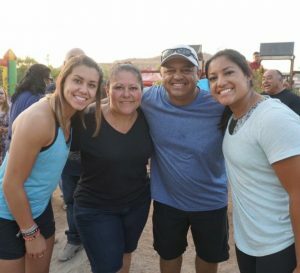 How did you hear about San Angelo CrossFit and why did you decide to join? I heard about SAFC through some college friends. I always wanted to try crossfit but was afraid I wouldn’t survive through a workout (which I still don’t know how I do sometimes). But my sister and I were bored in the gym and wanted something challenging. So we finally signed up for one of the foundations classes! end up doing a lot better than I was expecting. Crossfit will push your body to its limits. But I have learned that if you have the mentality that you can’t do it then you really can’t. Now, I love the challenging workouts! I think I have become mentally stronger with crossfit and have been able to push myself to do things I never would have been able to before. What is your favorite movement and do you have a favorite WOD? My favorite movement recently has been power cleans! 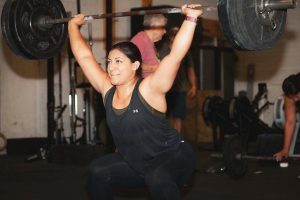 I can’t think of a favorite WOD, but I enjoy doing EMOMS… I always feel like I can push myself a little more in those workouts. If you were asked to name a WOD what would the name be and what would it include? I’m not sure what it would be named…. but it would have some type of handstand walk, deadlifts, kettlebell swings, and squats! What are some of your goals for the coming year? My goal is to get double unders constantly and muscle ups! I also would like to work on shoulder mobility because I have realized mine is not that great. How do you see CrossFit being different than other fitness programs? I think it’s different because you have other athletes there to keep you accountable for going to the gym. I also think it’s different because the coaches are there to help you and correct you when you might be doing a movement incorrectly. I think we are able to learn so much through them. I love SACF because everyone has always been so welcoming and I have met some amazing people at the gym! How can other people relate to your story? People always say that they can’t do crossfit because they aren’t in shape or strong enough or have an injury. But everyone has to start somewhere. In the workout there’s so many alternatives that can be done if you are injured or don’t have a skill. I was not in shape when I started. I used to workout all the time, but was recovering from an injury and have been able to work slowly and progress at my own pace. If you controlled the music, what would we be working out to? I’m not too sure…. I’m not too picky and I really like all kinds of music. But it would have to be something upbeat! What is something that others may not know about you? I did gymnastics for almost 10 years and was a cheerleader all through grade school and at ASU for 2 years.